Buy one of our caravan bedding packs and you'll be guaranteed to save money! These Bedding packs include everything you will need for your Coachman Vision touring Caravan fixed Bed. We have done all the hard work, so you can concentrate on enjoying your home away from home. These packs our made up of our top quality products. and come with a free Storage bag, that is ideal for using as a laundry bag whilst on your travels. To learn more about the features of each bedding pack just click on the product's tab above. Can't see your model of Coachman caravan? Then please contact us on 01929 471403 or use the Contact us form as we can supply bedding of all shapes and sizes to fit your Coachman caravan. The fixed bed Cotton Ripple Bedding Pack is perfect for adding luxury to your touring Coachman vision Caravan. 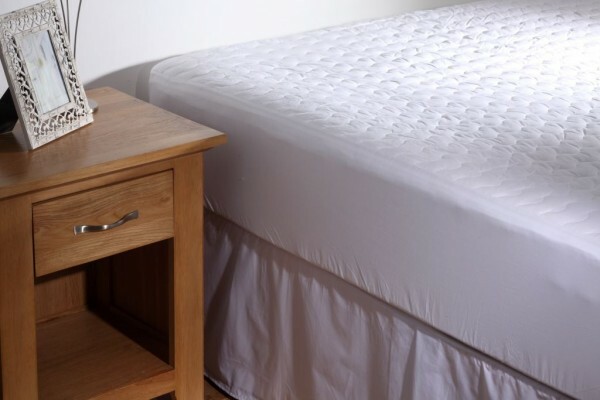 The ripple mattress Cover is filled with 500 grams of soft cotton layers with a ripple stitching design. The fitted sheet and duvet Covers are 100% Cotton 200 thread Count Superb quality. Our Micro-down duvets are filled with a luxurious alternative to natural Goose down that will not only keep you warm but also allergy-free. It is 100% microdown filling that shapes to your body for superior comfort. You can be confident that you will be warm and comfortable. Please choose whether you would like the light weight this includes a 4.5 Tog Duvet, The medium weight which includes a 9.0 Tog Duvet or our all seasons which includes both togs that you can button together for a combined 13.5 tog and you have a colour choice of White or Cream duvet cover. Please Choose whether you would like the light weight pack, this includes a 4.5 tog Duvet, The medium weight which includes the 9.0 Tog duvet or our all seasons which includes both 4.5 and 9.0 tog that can be buttoned together for a combined 13.5 tog and you have a choice of white or cream duvet cover. Click the button below to add the Coachman Vision Caravan Fixed Bed LUXURY Bedding Packs to your wish list.